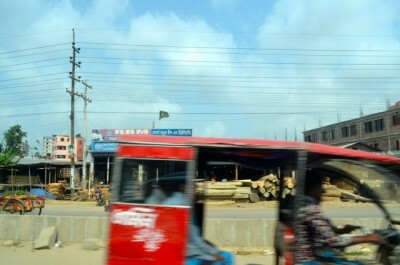 I have just been to Dhaka in Bangladesh. Everywhere, I saw the struggle for survival. Bangladesh is overcrowded, 164 million people in a country as small as one eighth the size of NSW. It’s almost 10 years since I last visited. This is a lightning trip to deal with an urgent manufacturing problem which has emerged in the latest collection of Ceramica di Manfredi, The Cup Suite, produced by Manfredi Enterprises. Manfredi Enterprises has a long-standing relationship with Bangladesh. Monno Ceramic, one of the largest porcelain and bone china factories in the world, is a manufacturer of several well-known brands in Australia, UK, EU and the USA. It has manufactured Ceramica di Manfredi collections since 2001. 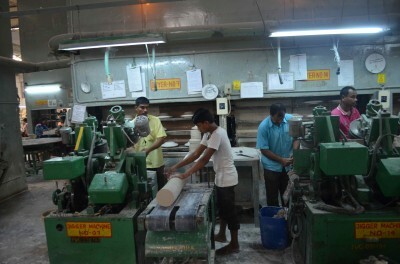 Located in the outer suburbs of Dhaka, the Monno ceramic factory sprawls over a number of hectares and employs more than 5000 artisans and craftspeople. I arrive in Dhaka on May Day, a public holiday for workers, and on this occasion, an unofficial day of national mourning, anger and disgrace for Bangladesh. A building, Rana Plaza in the district of Savar, housing five garment factories over five floors, collapses in the week before I arrive. It is full to the brim with workers, mainly women from rural Bangladesh, hunched over sewing machines. The death toll is mounting. I read local newspapers, watch CNN and get an idea of the drama unfolding. But it’s chatting with my driver and my minders that give me real insight. There was pride in his telling of how the rescue effort attracted many local people who came to the aid of those trapped. “The problem is everyone wants to manufacture the garments in Bangladesh because labour is cheap,” he says. He goes on to tell me that one international brand alone, H&M, exports 750 shipping containers of garments per month, a world record. 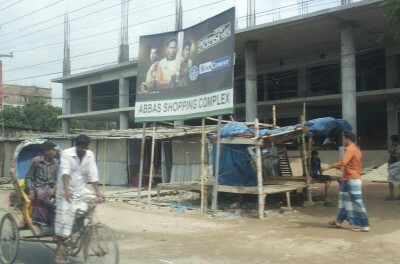 Dhaka is dynamic, colourful, exhausting and everywhere are the signs of a city under construction. 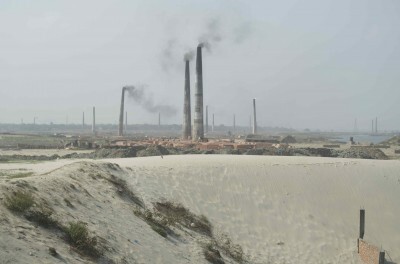 In a delta area which becomes flooded for half of the year, rudimentary brick works, fuelled by a booming real-estate market, dominate the skyline producing hazardous smog and thick smoke. It’s a hot drive from my hotel to the Monno Ceramic factory. 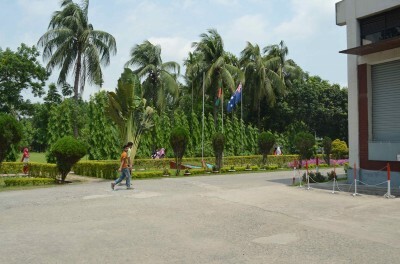 The temperature is in the mid-30s Celsius and the humidity is high. We travel past brick works where oxen are pulling carts full of bricks. On the return journey home, the animals are soaking in the cooling delta waters. 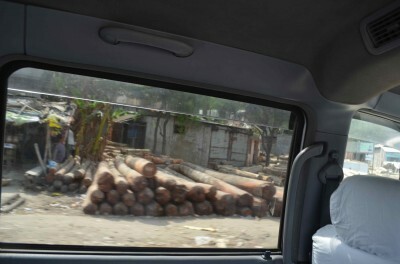 No such luck for the rickshaw drivers who are peddling and at work on the crowded streets, lined by piles of massive, un-milled logs, building materials and bamboo. I enquire where the logs are coming from. “The jungle,” says the minder. I don’t push the point. 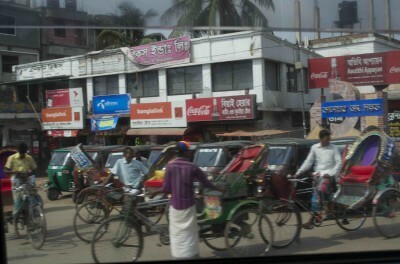 The rickshaws, motor bikes, buses, trucks and cars all careen down the roads at break-neck speed with chaotic purpose. I hold onto the back of the driver’s seat and hope I arrive alive. The journey leaves me emotional. I realise I care about what happens here. I remember the concert for Bangladesh, and it brings up memories, a nostalgia for my youth and the iconic music of Ravi Shankar and George Harrison. They cared. My meeting at the factory goes well. 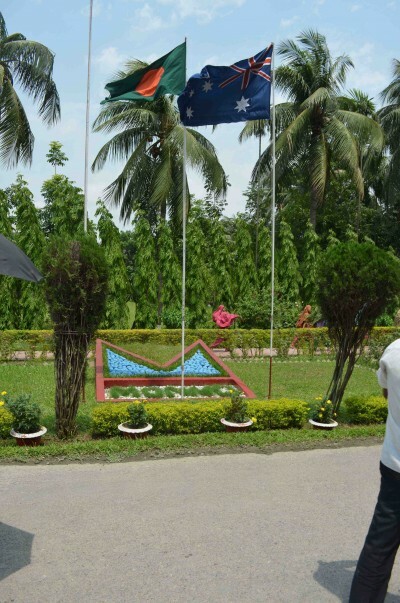 I am touched by the sight of the Australian flag flying next to the Bangladeshi flag to welcome my visit. I’m greeted by Rasheed Islam, the son of the owner, who is now the new Vice President. He and the International Marketing manager and Factory Production manager are all well-educated, with multiple international degrees in their fields. This is no make-shift operation, unlike many of the garment factories in the now notorious Savar district, which is all over the news. The stories emanating after the Rana Plaza building collapse in Savar reminds me of stories told 100 years ago about the sweatshops in New York’s garment district. Unscrupulous owners and bosses, dilapidated buildings, fires and exploitation of women workers led to the subsequent organisation of trade union labour movements. On my way back home and watching CNN in the lounge at Singapore, I see the news anchor, Christiane Amanpour, challenge Sheikh Hasina, the Bangladeshi Prime Minister, to acknowledge the problems of corruption in the garment industry. Hasina answers, yes, we have problems but also we have also had success with many improvements. Her answer comes across as concerned and defensive. Amanpour points out that the Bangladeshi brand in the EU, US and Canada is under threat with retailers threatening boycotts. I can relate to the reaction from the retailers. As someone who manufactures goods in a factory in Bangladesh, this story is not something to be proud of. I have always had respect for the Monno porcelain factory and how it looks after its workers in an unregulated environment. 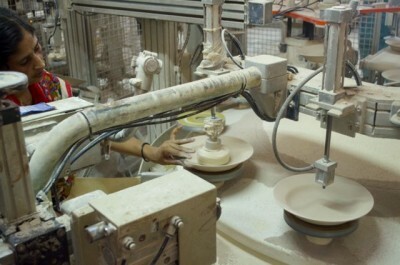 The work in a porcelain factory is hot and hard, with many aspects of the process finished by hand. 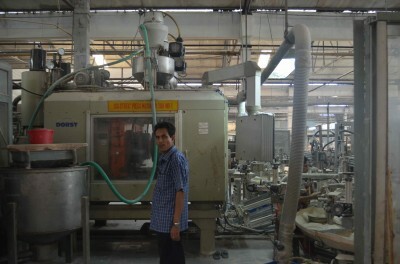 Monno Ceramic is proud of its investments in state of the art German machinery and technology. The company also prides itself on its employment practices and sustainability programs. It fosters a culture of caring for its workers and financially supports local welfare and educational programs. It provides educational opportunities, supports a home for underprivileged children, and has recently built a hospital for its staff and the local community. The Rana Plaza incident is blight on the reputation of all manufacturing industries in Bangladesh and points to structural oversights in regulation. Then again, is it unfair or even racist to tar all Bangladeshi industry with the same brush? I don’t see us calling for a boycott of all goods from the USA after the deadly fertiliser explosion in the city of West in Texas. Perhaps I draw a long bow? *”Before the collapse, power and swagger” by Jim Yardley, International Herald Tribune Asia, 2 May 2013.